"A friend gave me this recipe last Thanksgiving. Since then I have made it several times and everyone loves it! It's spicy hot flavor is a nice addition to any meal. Adjust the amount of peppers to taste." Place cream cheese and butter in a microwave safe 9x13 inch baking dish. Microwave on high until butter has melted and cream cheese has softened, 2 to 3 minutes. 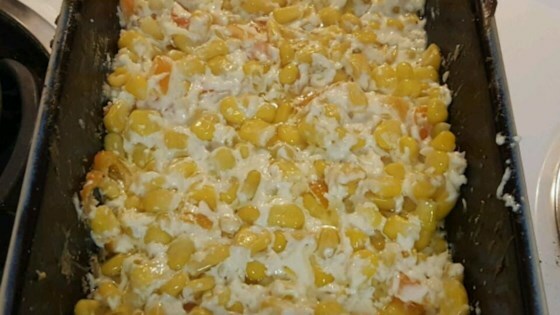 Mix white corn and diced jalapeno peppers with the butter and cream cheese. Bake in the preheated oven 30 to 35 minutes. Very Good !!! I could not bring myself to use an entire cup of butter though. I only used half a stick and also added a little grated cheddar and was very happy with the results. My sister made this Christmas and used it as a dip with scoops corn chips, a big hit! I used fresh corn cut off the cob - you could use a more mild green chile - frozen corn would work too. Not diet friendly but oh so good!